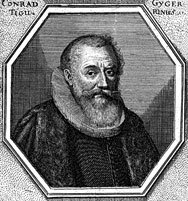 Hans Conrad Gyger (1599–1674) was a painter, mathematician, surveyor and cartographer in Zurich. Gyger was the first to systematically survey a larger area in Switzerland. This resulted in the map “Grosse Landtafel des Kantons Zürich“ (Great Land Board of the Canton of Zurich; 1664–67). This map surprises in two ways: firstly, a then still uncommon vertical perspective was used, and secondly, the map contains the oldest known example of a shaded relief in Switzerland. With his map Gyger reached a fundamental progress by displaying mountains – until then drawn in template-like side views – as elevations of mass. Thus continuous mountain ranges and valleys seen from oblique forward became apparent, not unlike today’s bird’s-eye-view-maps. Gyger also finished other more traditional maps of Switzerland.